For many years the NTC Foundation has offered SDWS teachers the opportunity to bring hands on authentic art learning experiences to hundreds of at-risk students. The program is called Liberty School. 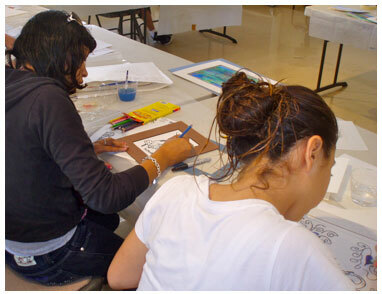 Secondary age students from ALBA (Alternative Learning for Behavior and Attitude), and JCCS (Juvenile Court and Community Schools) take classes in our gallery’s education center. Also, third graders from Dewey Elementary School are included in the program since this school’s population is mainly military families where parents are deployed away from home for many months. Students and teachers alike find this program extremely rewarding. 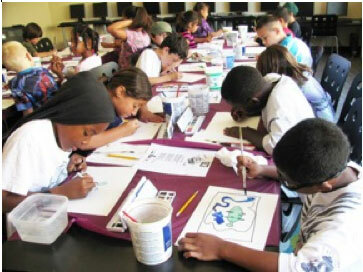 Dewey Elementary classes are currently under way while funding for ALBA and JCCS classes is still pending. Students from Dewey Elementary School really enjoy their watercolor lesson taught by a visiting SDWS Education Committee instructor. Student work is later on display at the school’s Family Back To School Night. 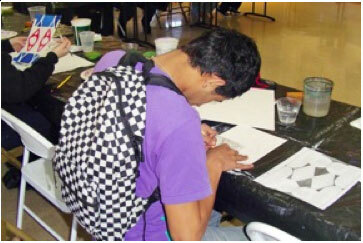 A student from JCCS works on an initial project requiring attention to design and watercolor techniques. These ALBA students really concentrate on creating cool letter designs to which they later added vibrant watercolor patterns. Completed work is matted so they can show off their final work and feel good about themselves and their accomplishments.